What to expect from a guitar amp under $200? All seasoned musicians know how important a good amp is. After all, amps can make or break a show. It's even been said that having no amp is better than a bad amp. An unsatisfactory amp used on stage is a frustratingly common problem that has a relatively simple solution. The best way to remedy a bad amp is to upgrade. That’s right - the best way to fix a bad amp is to replace it with a better one. This is often easier said than done as amp prices already have a reputation for being quite high.As they gain popularity and continue to improve, they continue to increase in price. Despite this, there are a number of great affordable amp options that can compete with the most expensive amps. You just have to know what to look for, know what models are best for your unique needs, and have a keen eye for price comparison. You can learn to recognize these key points and use them to your advantage, but it can take some time to truly train your eye. Luckily, since we understand that in the music world time is money, we’ve done most of the detective work for you. We have everything together in a short buyer’s guide, complete with suggestions of some of the best guitar amps under $200. An efficient amp with all of the finishings of a top-of-the-line model at a fraction of the price. The Line 6 Spider V20 is both stylish and functional. A sleek device that is chalked full of unharnessed potential and backed with great reviews. The Fender Champion 40 is a popular choice for both seasoned and upcoming musicians. The Peavey Vypry VIP 1 is a high-quality USB-connecting amp. It’s easy to use and boasts a diverse range of uses from professional recording to use in live shows. With built-in reverb and easy-switch channels, the Orange Crush 20RT is a smart amp solution for musicians on a budget. The Orange Crush 20RT goes to show that dynamite comes in small packages. A sleek, brand-name amp that is more than just an average device. The Marshall MG15GR offers awesome benefits and delivers great sound. The Spider V 20 has been designed to offer the ultimate experience. It has easy to use color coded controls and 16 diverse effect presets, in combination with a compact design and sleek style. This makes for a highly-desirable amp unit that's great for both rising musicians and seasoned guitarists. It weighs only 11 pounds and features a micro USB port for connecting a Mac, iOS, PC, or Android device. It also offers a companion app for remote control and recording software, as well as high gain and headphone output locations so its user can enjoy the amp without disturbing anyone around him/her. The Fender Champion 40 offers a ton of tonal versatility, modern amp voices, and a plethora of effects such as delay and reverb. The amp features an auxiliary input and headphone jack for an immersive music experience, as well as an open back panel for storing small accessories and electrical cords. It weighs in at a solid 35 pounds and is very durable.Its sleek, polished appearance puts its competition to shame. Plug in your MP3 player conveniently and enjoy the effects and easy dials. The Peavey VYpyr VIP 1 amp contains acoustic, bass, and electric guitar amplifier modes. It uses a USB bi-directional audio port and users can access the device's models and parameter controls through the device without connecting to a computer. It features an easy-to-access auxiliary port and an enhanced chromatic tuner. In addition, it has a modern design that's easy on the eyes and a price tag that won't break the bank. 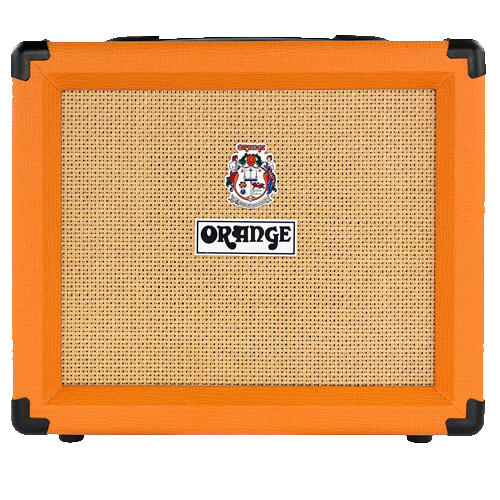 Getting its name from its brilliant orange color and sound that crushes its competitors, the Orange Crush 20RT is a high-quality amp offered at an affordable cost. It offers responsive overdrive, detailed saturation, and two footswitchable channels that give users access to a wide range of tones that work to enhance their creativity. You’ll enjoy versatility at your fingertips. It also offers an internal reverb and tuner, as well as a headphone/audio jackfor solo listening and fine tuning. The Marshall MG15GR is a simple amp with tons of great uses and a professional appearance. It weighs roughly 18 pounds and features a highly-trusted guitar amplifier combo that makes for roof-rocking sound. If you’re familiar with the Marshall brand, you’ll know that this model does have the trademark Marshall tone. The Marshall MG15GR is one of the most efficient high-power amps on the market, costing a fraction of what most battery powered amps do but working just as well, if not better. 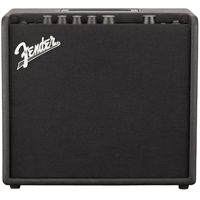 There are many features you need to consider when choosing the right guitar amp for you. Consider locations you will be playing in, whether or not you will need to travel with it and what you will be doing with it to find the right amp for you. It is important to consider the amount of power you will need in your amp. Higher wattages mean more power and a louder sound. At the minimum, you want to have a 10 watt guitar amp.But it is recommended you go higher if you want to do live shows or play in an outside setting, so that the sound emits loud enough. Amps need to be powered by something, and it is important that you consider what kind of power source will work best for you. There are battery powered amps that are ideal for traveling as well as amps powered by electricity. If you are going to be playing in your home it makes more sense to go with something you can plug right into an outlet. But if you want to be free of cords and move the amp as you need, it is more ideal to have something that is powered by batteries. While in many situations bigger is better, when it comes to speaker size on guitar amps you want to go with a smaller size. Smaller speakers allow you to create a higher quality sound and more articulate frequencies. Within this price range you can get both solid and tube state amps. Tube guitar amps are much less reliable so it is important to consider how often and where you will be using the amp, as well as how much versatility you need. Solid state guitar amps offer much more than the tube state amps, like digital modeling and built-in effects. The materials the amp is made of will speak volumes to its quality. Thickness matters and anything made from thin wood will not vibrate properly and function as it should. Find out where the amp was made, what kind of wood it is made from and how it is held together. If you can, see the amp in person before buying and look at the construction to make sure it is quality worth your money. It is important to have something well designed and that won’t crack or break easily, especially for travel amps. One of the best ways to guarantee you are getting the amp you want is to actually test it out. This can be done in person in shops where you can test out what your specific needs are and if it will be up to the task. Otherwise, you can look online for videos of people using that model of amp to see how it sounds so you can judge whether or not it is the amp for you. It is important to know what you can and can’t expect from a guitar amp under $200 so you can make an informed decision to find the right amp for you. Warranties are a must have for any electrical item because so many things can go wrong. With a budget of under $200 you can still get a warranty that lasts three, and maybe even five years. This gives you the assurance that you are purchasing something that is protected and you won’t be wasting your money. Whether you want to use the amp for home, travel or both, it is important to protect your equipment and your investment as long as possible. USB connectivity is common for guitar amps within this price range and can allow you to record right onto a device. For guitar amps under $200 you will see options for power ranging between 10 watts and 40 watts. You will need to consider the size of the location you are playing in, as well as how loud it can get in and around that location. For live shows you are going to want more power and a higher wattage. But if you are just looking to play in your home you can go with a smaller wattage. Guitar amps over $100 include effects that you will not get in cheaper models. This includes things like reverb, tonal delay, and booster buttons to give you a wider range of tonal options. For guitar amps under $200 you can get many different channels that you can use to control the tone. This means you can get higher or deeper tones and test the different channels to find the right one for you. The budget is key when looking for a great guitar amp. If you go too low, you can end up with a short lived and poor quality piece of equipment. But going too high with your budget can also be a waste of money.There is no need to overspend when the quality of both cheap and expensive ampsare the same. A $200 budget allows you to get a quality amp without breaking the bank or wasting your money.